“Curbing this inequality requires a clear understanding of its causes,” writes Brooking’s Jonathan Rothwell. “Three of the standard explanations—capital shares, skills, and technology—are myths. The real cause of elite inequality is the lack of open access and market competition in elite investment and labor markets. To bring the elite down to size, we need to make them compete.” He explains that–despite the claims of people like Robert Reich–corporate profits actually represented a lower share of GDP (4.9%) between 1980 and 2014 than between 1950 and 1979 (5.4%). So what is leading to inequality according to Rothwell? One way that the top 1 percent cements their position is by occupying the financial sector, and accessing above-market returns on their investments…The accredited investor rule has mostly been ignored by scholars of inequality. But legal scholars Houman Shadab, Usha Rodrigues, and Cary Martin Shelby are an exception. They have each written persuasively about how the rules contribute to inequality by giving the richest investors privileged access to the best investment strategies. Shadab points out that other countries (with less inequality) allow retail investors to access hedge funds. The law has also inflated the compensation of hedge fund workers—roughly $500,000 on average—by restricting competition. Mutual funds—which charge tiny fees by comparison—are currently barred from using hedge fund strategies because they have non-rich investors. If the law was changed to allow mutual funds to offer hedge fund portfolios, hundreds of billions of dollars would be transferred annually from super-rich hedge fund managers and investment bankers to ordinary investors, and even low-income workers with retirement plans. At the same time, we need more competition at the top end of the labor market. As economist Dean Baker points out, politicians and intellectuals often champion market competition—but what they mean by that is competition among low-paid service workers, production workers, or computer programmers who face competition from trade and immigration, while elite professionals sit behind a protectionist wall. Workers in occupations with no higher educational requirements see their wages held down by millions of other Americans denied a high-quality education and competing for relatively precious vacancies. 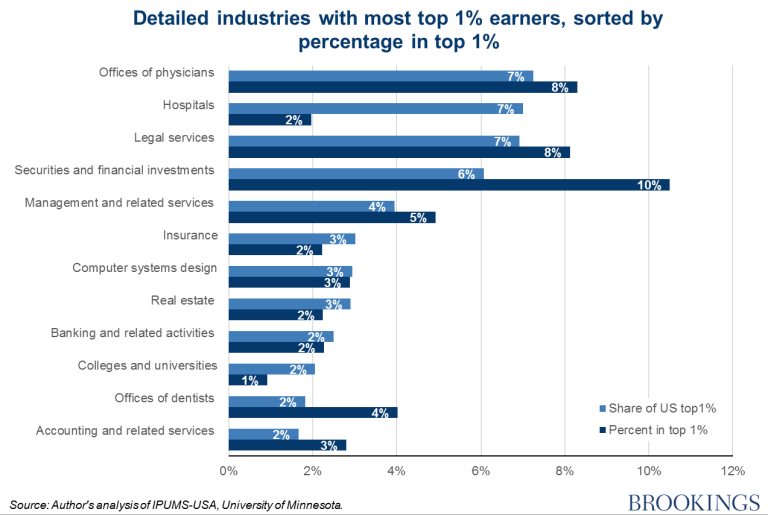 For lawyers, doctors, and dentists— three of the most over-represented occupations in the top 1 percent—state-level lobbying from professional associations has blocked efforts to expand the supply of qualified workers who could do many of the “professional” job tasks for less pay. Ultimately, Rothwell suggests that we increase the competition for the top 1 percent. Before Marx, Adam Smith provided a framework for political economy that is especially useful today. Smith warned against local trade associations which were inevitably conspiring “against the public…to raise prices,” and “restraining the competition in some employments to a smaller number than would otherwise…occasion a very important inequality” between occupations. For earnings to be distributed more fairly, our goal is not to stand in the way of markets, but to make them work better. This is really interesting, Walker, and it relates to one of the most provocative (and indisputable) findings in Piketty’s “Capital”. He studied the returns earned by a variety of college endowments. That’s a good thing to study because the information is relatively public, and there are huge differences between rich colleges with multi-billion dollar endowments and colleges with much more modest sums of capital to invest. What he found was that if you have a lot of money, you can get returns of 10%, whereas if you have smaller amounts of capital to invest, you’re going to see much lower rates (5% or less).